"A romantic debut laced with a bit of deception." Rachel Penrose has been wrongfully imprisoned in Bedlam by her uncle. While her uncle makes plans to kill her brother to gain the inheritance, she can do little but listen to his insane schemes. She knows that she has to escape and save her brother no matter the cost to herself. When she is rescued, she ends up in the hands of Sebastien Falconer, a man she has never met yet she is his sworn enemy. It seems her uncle has covered all of his bases by using Sebastien as the scapegoat for the crimes he has committed and using Rachel's name as the person responsible for informing on those criminal activities. Who can she trust? Could this man who claims to be her enemy truly be her only ally? Can she trust her instincts even though they are telling her that she might be falling in love with this man? Sebastien Falconer, a French privateer, cannot wait to get his hands on Rachel Penrose, the woman who has ruined his business. When he hears the sickly woman in his possession whisper her name, he finds it hard to believe that this frail creature was the one to bring him down. He decides that it is in his interest to keep her close to see what other schemes she may try to pull. He believes that she may be in league with his brother, and wants to catch them at their game. However, the only web he seems to be falling into is the one that he is weaving. Has Rachel been telling him the truth all along? Has he found the only English woman who can bring him to his knees? Can he afford to let her go? Lisa Marie Wilkinson has crafted a spectacular historical debut. Her story is full of surprises that keep the reader wondering what will happen next. I instantly fell in love with her writing and her characters. Rachel seems to be a very innocent young woman, yet her situation changes her into a woman ready to take on the world. Sebastien is a very worldly man who is confronted with a very innocent seeming obstacle. When the two clash, there is instant chemistry though they fight it very well. 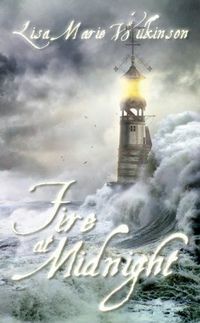 FIRE AT MIDNIGHT is an awesome read that takes us through a volatile situation where passion and betrayal go hand in hand. The non-stop action, the fascinating plotline, and the intriguing characters are sure to keep the readers glued to the pages until the book is finished. Ms. Wilkinson has earned her place on the keeper shelf. Rachael Penrose is confined to Bedlam insane asylum in London after discovering that her uncle Victor plans to kill her brother in order to inherit the family fortune. Victor, with a�gang of criminals, uses French privateer�Sebastien Falconer as the scapegoat for his crimes. When Victor spreads the lie that Rachael informed on Falconer�s smuggling activities, Falconer vows revenge on the girl. Gripping suspense and romance play out in front of numerous historical details, including a violent storm that devastated England in 1703 and swept the Eddystone Lighthouse into the sea. Re: A romantic debut laced with a bit of deception. My sincere thank you to Ms. Kammer for her wonderful review of my debut novel! Sounds like a great read! Can't wait!